There is a well known catch phrase amongst divers that goes, “the wetter, the better!”. I have recently worked out that this is not always true. After years of shivering and shaking, blue lips, numb fingers and miserable surface intervals on the back of dive boats in horizontal rain, I have finally given in. I have invested in a dry suit and already I know, there is no going back once the temperature drops! So what is a dry suit, and how does it work? A dry suit, as the name suggests, keeps you dry (hopefully!) by using a waterproof outer layer combined with watertight neck and wrist seals and waterproof zippers. Dry suits keep you warm by the simple fact that you wear base layer clothing or thermal undergarments under your suit. Your body temperature is then regulated by the use of an insulating layer of air between your body and the waterproof outer layer. This differs to wet suits which rely on your body heating a layer of water inside the suit to provide temperature regulation. In wet suits, the neoprene provides some thermal protection, the thicker the neoprene the more insulation is offered. In dry suits, the outer shell offers little or no thermal protection, this is provided by the under garments which can be suited to the prevailing water temperature. Water conducts heat away from your body 25 times faster than air, resulting in dry suits being far more efficient at maintaining your core body temperature. A second Low Pressure Inflator hose is required to add air to the dry suit. So what is diving in a dry suit actually like? To be honest, I was a little apprehensive about dry suit diving. I had never dived in a dry suit before and really should have had a test drive in the pool beforehand. That didn’t work out, so here I was, a dry suit virgin, heading out into the worst diving conditions Sydney could throw at me. Driving rain, big swells, and 16 degrees water temperature. Seemingly a baptism of fire as my induction into dry suit diving! My apprehension was heightened by the number of dry suits pros on the boat that insisted that they tag along with me on my first dive, just for a laugh. I had visions of floating upside down, rapid ascents and buoyancy faux pas, all to the delight of an audience expecting comedy! The first thing that struck me when I jumped in was how pleasant it felt. Normally, I find the slow seepage of water into my suit on entry dreadful. None of that today. I was expecting floaty feet too, none of that either. I opened my dry suit arm vent fully and performed a buoyancy check, also dumping all the air from my BCD. Despite adding an extra 6lbs of weight on top of my normal 12lbs that I use with a 7mm semi dry with hood, gloves, socks, and a neoprene/fleece under garment, I felt a little light. I added one weight more for good measure, not wanting to be too light on my safety stop and waited for my loyal fans! Not wanting to risk drama, rather than perform a free descent, we chose to swim to the front of the boat and use the anchor chain to descend down. I followed the chain down without drama. What is really obvious in a dry suit, is the pressure differential with depth, creating a squeeze on the suit. 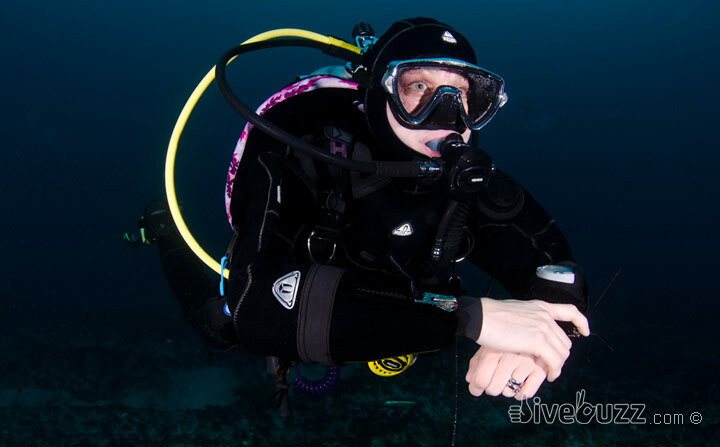 As any open water diver will know, pressure increases with depth. On descent, air within the suit will compress with the increased pressure. To combat this and prevent an uncomfortable “squeeze,” air will need to be added to the suit on descent. This is achieved via an additional low pressure inflator hose from your tank to a connector on the dry suit, usually located in the middle of the chest. A couple of short bursts on the dry suit inflator hose easily relieved my squeeze! 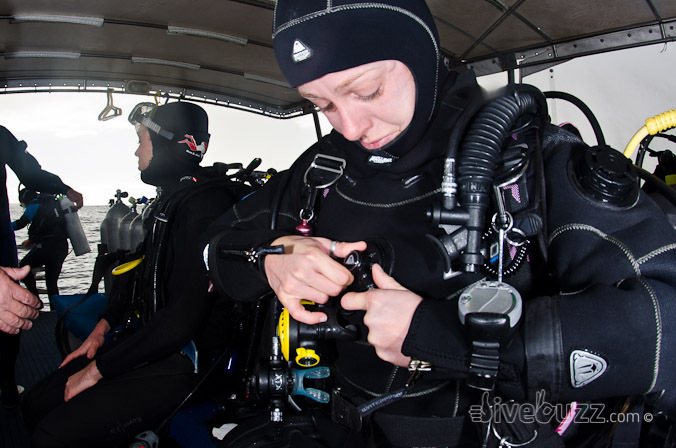 Normally, assuming a diver is correctly weighted, minor adjustments will be made to the amount of air in the BCD with changes in depth. With a dry suit, the BCD is really only used to establish buoyancy on the surface. During the dive, air is added to the suit as required with changes in depth. Similarly, an adjustable vent allows excess air to be dumped as required. My first two dives went without a hitch. The buoyancy I found was easy, with little need to adjust much throughout the dive and no need to touch the BCD whatsoever. Body positioning is key however, and any excess air in the suit will vent assuming you are correctly positioned with the vent at the highest point. My dry suit has a standard shoulder vent, positioned on my left arm, some dry suits also have ankle vents which may be preferable for less experienced divers finding themselves in an inverted position with too much air in their boots! For my suit, I found that the venting could be achieved with what are really quite subtle movements in the elbow. Although having a bit of a play with the exhaust valve, I really did not adjust it significantly at all during the dive. On ascent, ensuring the vent is fully open will prevent an uncontrolled rate of ascent, allowing the expanding air within the suit to freely escape. Several dives into my dry suit career, I am now down to using 15lbs of lead, just 3 lbs more than I require with my 7mm semi dry suit, and I’m loving it. A couple of slow ascents, next to the anchor chain (just in case!) completed my dry suit experience without drama. A very comfortable experience and now I know there is no going back! Year round comfortable, temporate water diving is assured. The best bit, stripping out of the dry suit and you are in dry clothes. No more shaking and shivering on dive deck, trying to change out of wet togs with a towel flapping in the wind and balancing on one leg in high seas! Love it! inverted position (air in your boots) – kick, tuck and roll. As with so many aspects of diving, practice makes perfect. So what are you waiting for? 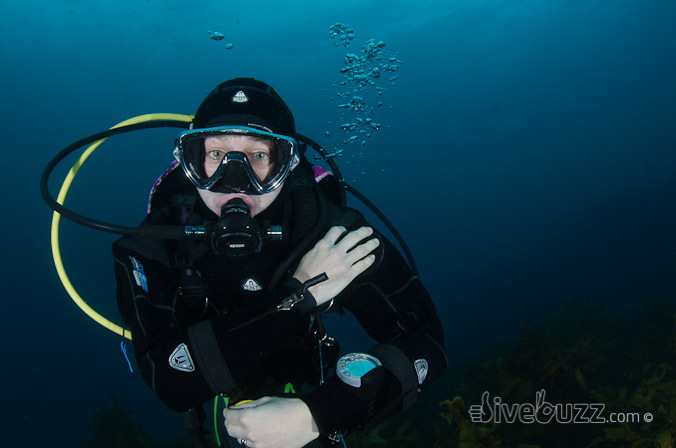 Try a dry suit dive today and there will be no more excuses to getting your DiveBuzz when the water temperature drops!